This week marks the 130th anniversary of the birth of a man who represented Kent and England at both football and cricket, a feat unlikely to be repeated in the modern professional era. 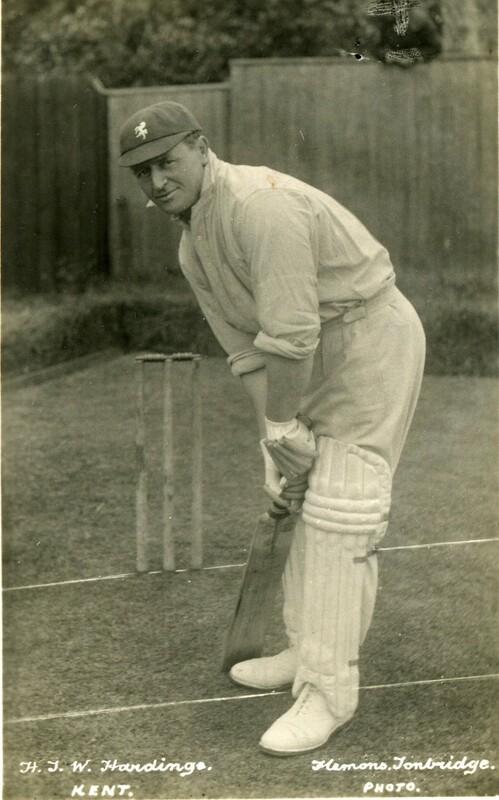 Harold Thomas William Hardinge scored more than 33,000 first-class runs in his 32-year Kent career, second only to Frank Woolley in terms of runs scored for the county. "Wally" made his debut as a 16-year-old and played until the age of 47 with his most prolific season aged 42 when he scored 2,446 runs at an average just under 60. It is the third most prolific season by a Kent batsman with Frank Woolley achieving the record return of 2,894 runs the same season as Hardinge's best. He was a Wisden Cricketer of the Year in 1915 and became thethe third cricketer to score a double-century and a century in the same match,after C. B. Fry and Warwick Armstrong. In the winter months, Hardinge was an accomplished footballer, playing inside forward for several Kent clubs before spells at Newcastle United, Sheffield United and Arsenal. He earned one England cap in 1910 against Scotland before he served in the Navy during the First World War. After retiring from football in 1921, he concentrated on cricket and coaching football with a stint as caretaker manager of Tottenham Hotspur in 1935, shortly after his retirement from first-class cricket.